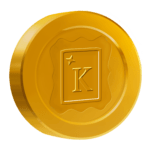 Members of KeLibu automatically earn KeLibu Koins as our way of saying “thank you” for participating on our site! KeLibu Koins can be used to “purchase” eligible PDF patterns offered on kelibudesign.com. Becoming a member is easy … register an account and you’re all set. As a bonus, we’ll give you 20 KeLibu Koins just for signing up! In addition to earning “Koins” for making purchases, you can also pick up extras for other activities on our site, including posting photos of the items you make using our patterns, sharing your favorite patterns via your social media accounts … even just stopping by on a daily basis to see what’s new! Earn 10 KeLibu Koins for each $1.00 you spend at kelibudesign.com! You’ll even earn 1 KeLibu Koins for every day you visit KeLibu! Methods of earning KeLibu Koins and the value for each action subject to change without advance notice.